Mint Hill, North Carolina is located in Mecklenburg County, just south of Charlotte and offers a suburban feel and a variety of options for residential real estate. 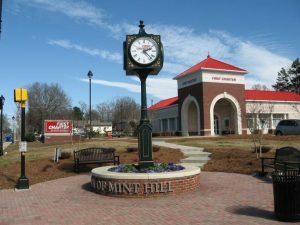 Mint Hill spread over two counties; Mecklenburg and Union Counties, and is only 25 minutes from uptown Charlotte. The recent construction of I-485 has made the commute to and from Mint Hill even easier and quicker, making this a great option for commuters. Brand new luxury communities are popping up all over the town as well as new shopping centers and industrial parks, giving Mint Hill a “live, work, play” feel.